PTMSC Blog : It's seal pup season! Here at the Marine Science Center, we're responsible for managing the East Jefferson County Marine Mammal Stranding Network. This means that we serve as an educational resource and as the first responders in our area for any report of a stranded marine mammal. We have a fantastic group of volunteer responders that we dispatch after receiving a call reporting an animal. These responders either collect data (if the stranded animal is dead) or construct a barrier to protect the live animal from curious (but intrusive) humans on the beaches. 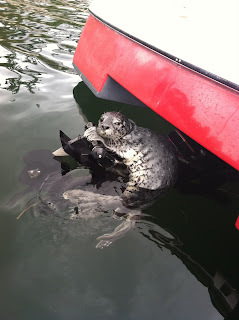 In our region, harbor seal pupping season is from June to October and as a result, these are VERY busy months for us. During this time frame the pups are being born, learning how to forage on their own and being weaned from their mothers. Under the Marine Mammal Protection Act, harbor seal populations have recovered to healthy numbers. Still, they sometimes need our protection while they're hauled out on our beaches. The pups frequently come ashore to rest while their mothers are foraging and they need to be left alone during this time. If humans are nearby, the pups may not be able to sleep and the mothers are more reticent to return and retrieve the young seal. Unfortunately, only 50% of harbor seal pups will survive their first year. Causes for this high mortality rate include premature birth, disease, infection, dehydration and predation by marine and shoreline predators as well as domestic pets. A common misconception about the role of stranding networks is believing that we serve as “seal rescuers”. As a stranding network we hope to prevent any deaths related to human interaction or interference but this is not always possible. Our best tool is prevention through education and this is what our responders excel at. The goal of the Marine Mammal Stranding Network is to educate beach goers about the ecological and behavioral needs of the seals while making sure they maintain the appropriate distance (the National Marine Fisheries Service recommends maintaining a minimum distance of 100 yards from any marine mammal). This distance minimizes the likelihood of disturbing a resting animal or stressing an animal that is recovering from illness or injury. If you see any marine mammal on the beach PLEASE give us a call. 1. Observe from a distance using binoculars or a spotting scope if you want to see the animal close up. 2. Keep pets away. Dogs are naturally curious about other animals in their environment. Seals pups can easily fall prey to dogs, to avoid a negative interaction dogs should be leashed and kept away from the seals on the beach. Older seals may bite in self defense. Some diseases are infectious to both dogs and seals, and may pose a risk to humans as well, if they come in direct contact with an infected animal. Thanks everyone who works with us to protect the welfare of local marine mammals! Nudibranchs, Abalone, and Rockfish! Oh, my! !